A stylish store is nestled in a fun little setting just north of downtown. Fashions from fun to funky to elegant, grace the racks in a whirl of color and contemporary style in this decidedly elegant boutique. Audrey's boutique carries a distinctive collection of clothing, accessories, jewelry, foundations and formal wear for women of all shapes and sizes, 4P-24W. 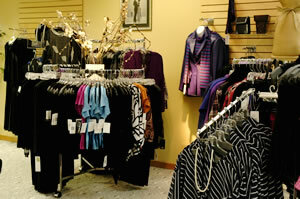 For more than 25 years this shop has helped to style the women of Spokane. Cindy Green, the owner feels strongly about stocking an interesting array of better-quality fashions to meet her customers high-quality standards. In their fashionable choice from Audrey's, the mother of the bride and mother of the groom will both sparkle at that special wedding of their children. Going cruising? The boutique has just the right things to make you stylish on the waters! Whether it’s ready-to-wear or career wear you will find a wealth of choices to fit both your size and taste. Need a good foundation for all that style? Audrey’s has an extensive area dedicated to foundation wear, hard to find sizes and a trained staff to make sure the fit is perfect. A shop specialty is their dedication to the post-mastectomy woman. The highly trained staff is sensitive to the emotional, as well as, physical needs of their clients so that every woman can feel good about herself and her body image. In a separate area, a full range of products provide the post-mastectomy woman with an alternative to breast reconstruction with the latest in superior quality breast prosthetics from Amoena. Parking is never a problem at this shop. You can expect to be met at the door by the shop greeter, Lacy with-the-pink-bow, the tiniest little bundle of white fluff you ever saw! 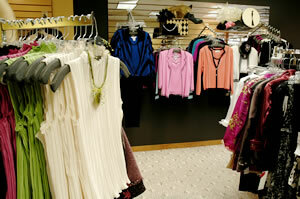 Discover Audrey’s, one of Spokane’s delightful unique finds for the fashion conscious woman.